Another year, another plum cake. It’s kind of funny because I used to hate plum cake even though I love plums. I cold eat raw plums by the bucket. But when the fruits are put into the oven those beauties often become the beast. They come back transmuted, smitten with a weird flavour nobody seemes to notice. But I can’t be the only one? Somebody must have jinxed the plums and everybody around them. Or me? I know now that the jinx must just be a lack of sugar. The Italian plums which are so common in Germany are often sold when they are very firm and not quite ripe yet. They are sour and that sourness turns into something slighty bitter with a hint of blackstrap molasses when plums are baked. 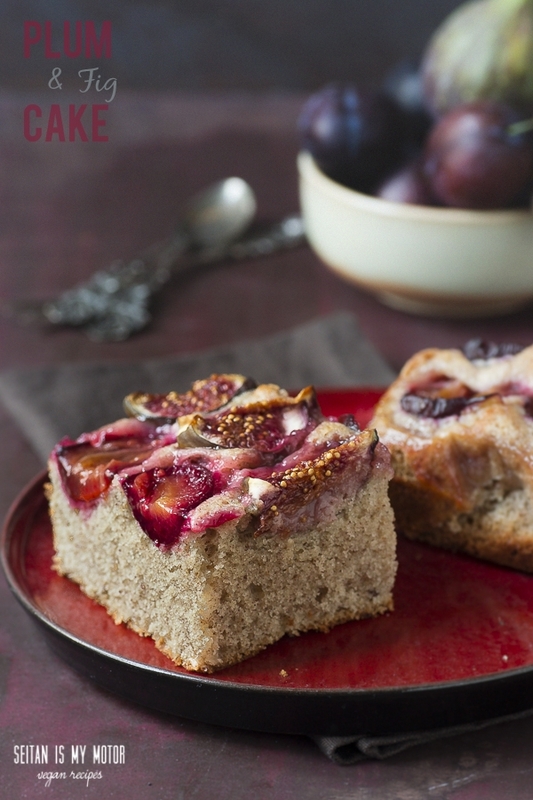 So you have to choose ripe and sweet Italian plums for your cake to avoid the taste disaster. I think with the following recipe I have eliminated everything I used to hate about plum cakes. Instead of a dense crust I made one that is fluffy, soft, and light. I also used ripe plums and mixed them with sweet figs. I probably should have put some streusel on top to make it perfect. But that would have ruined the pretty and colourful top. *Sift before measuring; I used this recipe for the vanilla sugar. Preheat the oven to 400°F and line a 11×7 inch rectangular pan with parchment paper. Place flax seeds in a large bowl and whisk in hot water. Let sit for 10 minutes. Add nut butter, milk, yoghurt, oil, and sugars. Whisk well. Add remaining ingredients and mix well. Your batter will be very stiff. Pour the batter into the prepared pan and spread out evenly. Place plums and figs on top and carefully press them into the batter (only a bit!). Sprinkle with sugar and bake for 40 minutes. Tip: This can wonderfully be made a day in advance. Let the cake cool and cover with aluminium foil. Keep it at room temperature. Lolol “the sourness turns into something bitter with a hint of blackstrap molasses” I don’t know why but I love how this reads. I’m going to describe bitter people as being with a hint of blackstrap molasses.